The treehouses at Cabanes als arbres offers nature lovers the joy of staying in direct touch with the trees and their ecosystem. The pleasures of an exile among the foliage, some nights in a nest placed in the framework of the branches of a beautiful tree awaits the overnight camper. 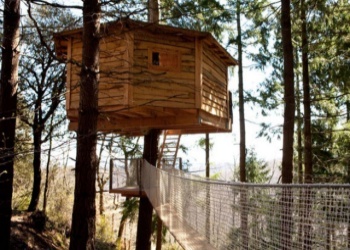 These treehouses are aubmerged in an ocean of branches in the northeast of Catalonia which is about an hour from Barcelona, Spain in the county of La Selva. This resort consists of ten comfortable treehouses that are perfectly camouflage within the foliage and each treehouse is named after a bird. 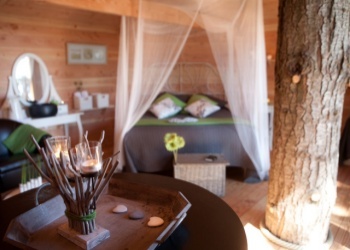 One of the great attractions of staying in a tree house in this enchanting corner of Catalonia, is the feeling of freedom and privacy it offers. Everywhere you look, you feel surrounded by the ease of the chirping of birds, and the murmur of the hidden secrets of the forest. A truth somewhat misleading, since within a few meters emerges another of these wooden wonders or the country house, The Vileta.